This is my favorite time of year. Everything is starting to get ripe in my own garden. Farmer's markets are getting into full swing. And luscious things are in season everywhere. One of my favorite local farm markets is Adams Farm, owned by, you guessed it, the Adams. I suppose that would make them the Adams Family. Anyway, I stop by there at least a couple times a week all summer long ... they have the best peaches and cherries right now and I've been enjoying the heck out of them! These black sweet cherries made an excellent addition to a salad and also a dressing chock full of summer goodness. This couldn't be simpler or faster to make. Just chop the lettuce (which I got from a local CSA, more on that soon! ), slice the cucumber and onion, add a handful of fresh, pitted cherries if you like. In a blender, puree everything but the dried cherries until very smooth. Stir in the dried cherries and add to the salad. Salt and pepper to taste.Crushed red pepper flakes are always good, too! 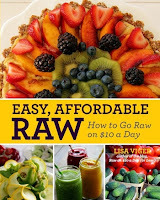 My book, Easy Affordable Raw, is now available in German! Both editions have more easy recipe like this using commonly available ingredients! Get your copy at any bookseller :). 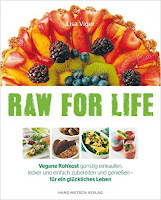 Here's the Amazon link to the German edition! And next to it is the English. 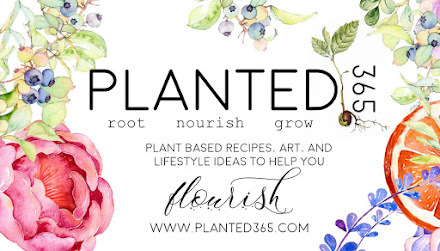 If you've already read the book, I would be absolutely thrilled if you left a review!